—British-based security writer Graham Cluley reports today that a number of companies have received email threatening their sites with distributed denial of service (DDoS)a attacks if they don’t pay the equivalent of US$720 in Bitcoin by Sept. 30. I’m reaching out to my Canadian contacts to see if the threat has been received here. 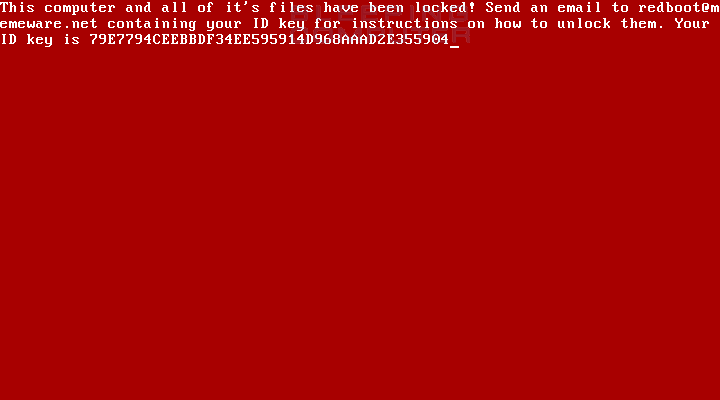 —Lawrence Abrams at Bleeping Computer reports that a researcher named Malware Blocker has discovered a new bootlocker ransomware, which has been dubbed RedBoot. The code will encrypt files on the computer, replace the master boot record of the system drive and then then modifies the partition table. “As the ransomware does not provide a way to input a key to restore the MBR and partition table, unless the ransomware developer has a bootable decryptor this malware may be a wiper,” says the news report. That means paying the ransom and expecting a decryption key may be a waste of money. When executed it extracts five other files into a random folder in the directory that the launcher was executed. These files are boot.asm, assembler.exe, main.exe (which encrypts the files), overwrite.exe (which overwrites the MBR), and protect.exe (which terminates and prevents various programs from running, including task manager and processhacker). However, the authors also note that the level of sophistication is increasing. For example, the WannaCry and NotPetya versions included worm functionality to spread across networks. And some ransomware is thought to really be a cover for nation-state backed attacks aimed at wiping data from victims’ machines. –Buttressing this is a column by Steve Ragan at CSO Online, who reports that at last week’s DerbyCon security conference in Louisville a network administrator at a small U.S. law firm talked about how he survived two ransomware attacks: Daily backups that are monitored and tested. There’s a daily, a weekly, a second daily that isn’t on a shared drive, and offsite backups. His other strategy is awareness training. Note that this firm was stung by ransomware — in one case the malware came in an image, which a staffer was expecting to receive. By coincidence, apparently, the first name the attacker used in the message was the same as the one the staffer was expecting so the image was opened. However, the firm was able to recover by being prepared. So while doing the basics — patching, backups and awareness training — are vital today, remember this from the Carbon Black researchers: As the sophistication of these attacks increases, security teams will have to implement better lines of defense to detect complex malware and adversaries using non-malware attacks to encrypt data.